Samsung isn't famous for its timely updates, especially when it comes to its low-end and mid-range devices. They often need to wait several months to a whole year to receive a major Android OS update, but the latest news about some of the Galaxy J5 models is a breath of fresh air for many owners of the handsets - Android 8.0 Oreo is definitely coming. It became clear after the WiFi Alliance certified a total of 13 Galaxy J5 variants as Oreo-ready, which means that Samsung is almost done with the update. But don't get too excited, though, as not all J5 handsets will get the biscuit - the original 2015 Galaxy J5 and all 2016 Galaxy J5 models are surely out of the question. The listing reads about 13 versions of the Galaxy J5 (2017) including the J5 Pro and the dual SIM versions. Here are all of them: SM-J530GM, SM-J530GM/DS, SM-J530F/DS, SM-J530Y/DS, SM-J530G, SM-J530S, SM-J530L, SM-J530F, SM-J530FM/DS, SM-J530K, SM-J530YM/DS and SM-J530Y. 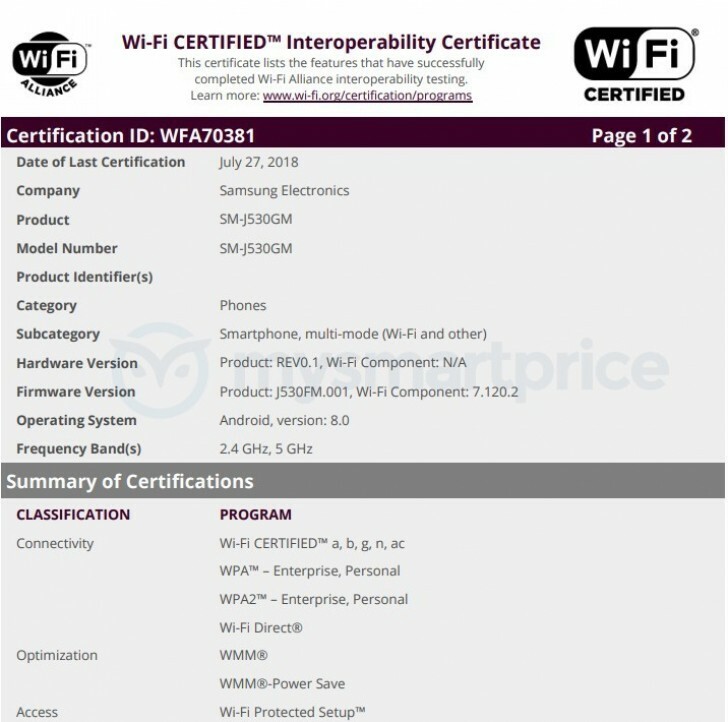 Don't expect the update to roll out that soon as the WiFi certification is just a part of the process and the firmware needs more extensive testing before being released to the public. The smartphones are also expected to receive Samsung's Experience UI 9.0 excluding some of the features the flagship models have. J is their budget line, A is their midrange. What about J5 with 8.1 previously listed in benchmarks?